It’s unfortunate but true—fleas love dogs. 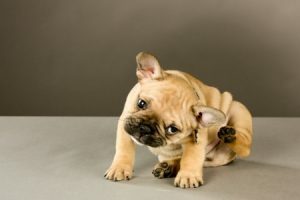 These irritating pests make your pup’s skin itchy, bite you, and, if you don’t take care of the problem, can take up residence in your carpets and furniture. However, we have good news! There are steps you can take to treat and even prevent fleas. They say prevention is the best cure! Try a flea collar to keep fleas off your pooch. The best kind emits a gas that is toxic to fleas (but harmless for dogs), which is absorbed into Fido’s subcutaneous fat layer. Your vet can also talk to you about prescription flea medications that work to keep fleas away from your pup. Flea baths are a good first step, but keep in mind that they’re not meant for lasting control. Apply spot-on treatments to kill fleas, but avoid bathing your dog in the four to five days prior to application. Fleas think your couches, carpets and yard make comfy places to hang out. Wash all bedding regularly in hot, soapy water. After you vacuum all the flooring in your home (not just carpet), throw away the vacuum bag. You can use nematodes, which are tiny multicellular organisms that live in soil, to minimize flea populations in your hard. Now that you’re prepared to deal with fleas, it’s time to get a dog! Check out Pauley’s Pups to meet an adorable selection of puppies and toy breeds. Contact us at 804-798-7877 to learn more and schedule a visit.